The crew were divided into a starboard and larboard watch, working on an 8 hour shifts. The watchers were, in their turn, separated in teams of 7 - 9 men, who fetched and ate their food from a common dish. The crew were better off on Swedish than on other nations' ships, said Wallenberg (1769). "3 good meals a day, twice tea water, vodka once a day and more often so if the work is hard, such as during a storm, touching land or lifting of the anchor." The menu for the crew was uncomplicated / simple, at the Gothenburg departure, the Captain had one dining order, similar to the one used in the navy. Salted beef on Mondays, Thursdays and Sundays. Pork on Tuesdays. Dried fish on Wednesdays, Fridays and Saturdays. Together with this, was served peas, barley, butter or oil on all days. The weekly ratio was dealt out to each men, salted meat, 1.25 kg, pork 200g, peas 2 liters, barley 2 liters, 650 grams dried fish, 430 grams butter or 0.3 liters of oil, 2.5 kilos of bread, 100 grams of salt, Light beer of water, 9 liters. Together with this, half a medium sized salted herring and 40 centiliters of vodka was given for breakfast in northern waters. In bad weather, the Captain allowed for a larger ration of vodka. Spanish liquor should be diluted with one-third portion of water. Any of these conditions could be adjusted according to time and circumstance. The preparation of the food can be said to have been within the limitations of the possibilities. Of pork and salted beef, of cooked beef, you could have fat and broth. To this you could serve boiled barley and boiled peas together or separated, ship's bread, which were rock hard lumps of flour, salt and water, together with butter or olive oil. From ship's bread soaked in water or soup, you could have some sort of porridge maybe with some added vinegar. Even if the insects in time made the ship's bread more crumbly / porous, they were not actually intended to be eaten dry. They were meant to be soaked. During good circumstances, ship's bread could remain edible for 50 years. Together with boiled fish, this was the entire menu; fresh food as livestock, fish and turtles was served if there were any. Strong vinegar was handed out in large amounts; the belief of the time was that anything strong smelling was also very healthy, so this was used both inside and outside. The provisions for the trip to China was taken onboard in Gothenburg and Cadiz. For the return trip, provisions were taken in Canton. Besides this, the supplies were replenished whenever / wherever they had an opportunity, which was not at many places. Every ship brought around 80 cubic meters of water, around 110 tons of provisions and a large amount of livestock from Gothenburg. Some of the provisions they brought from Gothenburg and Cadiz lasted even on the trip home / homebound voyage. They were stored in the 'banks halls' (halls built on the river banks) at the anchorage, Whampoa, during their stay in China. The provisions left on their homecoming from China could be sold to the next expedition to do a full new round trip to China. Exactly what provisions did the Gotheborg bring onboard when departing from Sweden? There are no reasons to believe that it should've been different from the normal. It should have been around 12 tons of dried ships bread, 10 tons of salted pork, meat and beef, 2-3 tons of dried fish, 15-25 liters of barley, 10,000 - 20,000 liters of peas. 3,000 - 4,000 liters of beer; 1,000 liters of hard liquor or vodka. 10-20 barrels of salt plus a number of oxen, pigs, goats, turkeys, geese, sheep and hens. What would you have eaten onboard as a crew member? What you ate depended on who you were. Onboard, there were individuals with widely differing financial resources. All higher officials onboard paid for their own supplies and food on board and brought whatever they wanted. Highest rank of all onboard were the super cargoes that had almost no limitation on how extravagantly they could live, provided they had brought a good cook. The only limitations were the practical fact that they would be at sea and the provision would be limited to what could be kept fresh and away from attacks by insects etc for the duration of the trip. During every trip, there were perpetual complaints about the shortcomings of the food from all ranks on board. As for the first table, a butler and their own chef was taking care of their needs. Table seating was set by social regulations and strictly hierarchic. To avoid problems, the East India Company provided the Captain with a fixed seating list, which as far as we know was strictly adhered to during the whole trip. Onboard was also a second table where they were to be happy with lesser quality food compared to the first table with no alcohol or wine. There was also a school onboard for upcoming trainees / cadet. Cadet school onboard. These had the same food as the crew together with the constable who was in charge of the mid-shipmen or cadets. 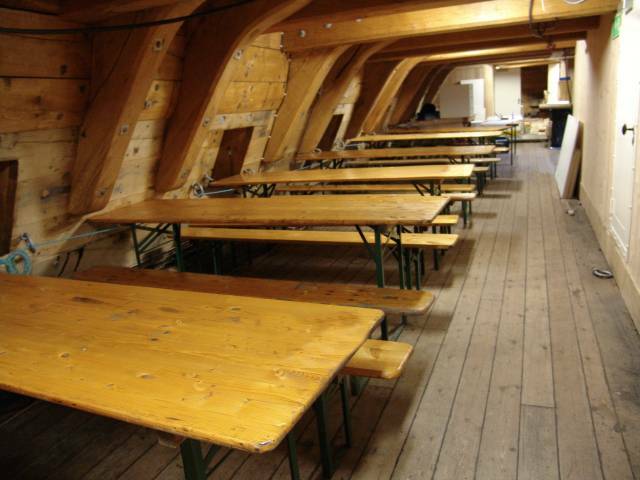 The setting of the tables where the crew would have had their food could fairly well be illustrated with an actual photo from the rebuilt East Indiaman Gotheborg III. The height of the area was slightly lower; the light would have been mostly what came in through the cannon gates when open. The mid area of this deck would have been occupied by livestock and poultry kept as fresh food supply for the voyage. Photo: Jan-Erik Nilsson, May 30th 2005.